Drew Springer, the firm’s founder and owner, serves as portfolio manager and a financial advisor for the firm. 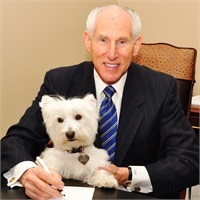 Drew graduated from North Texas State University in 1966 and received a Bachelor of Business Administration in Accounting and Finance. Prior to opening Springer Financial Services, Drew was an Operational Auditor for Standard Oil of Indiana, a Controller for the Tandy Corporation and Financial Vice President for Payless Drug Stores. In 1974, with the desire of utilizing his experience, education and expertise, Drew acquired in corporate America and opened Springer Financial Services on the square in Weatherford, Texas. Springer Financial Services developed into a successful venture and has prospered for over four decades. Drew has built a successful business on three simple principles: Trust, Experience and Simplicity. Drew has specialized in money management, and tax and estate planning. He is registered as a Series 1, 3, 24, 63 and 65 broker. Drew and his wife Linda have four children and nine grandchildren. Drew has been past-president of the Weatherford Chamber of Commerce, Parker County United Way, Weatherford Industrial Plan, and Weatherford Noon Lion’s Club. He also served on the Weatherford City Council as a City Commissioner and a member of the Water and Electric Board. In 2004, the University of North Texas honored Drew as their Outstanding Alumni in the School of Business’s Accounting Department. Drew serves on the Foundation Board for the University of North Texas and the Camp Fire Foundation Board.